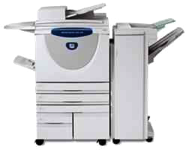 Sending or receiving a fax couldn't be easier ~ just use The Graphics Factory's high-speed Fax Service. 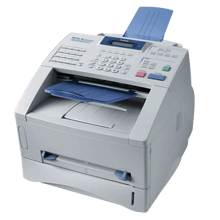 Our fax machine is on 24/7/365 and always ready to receive your fax. Just have it sent to our fax line at 250-723-1990. Please ensure the sender puts your full name and telephone number on the first sheet so we know who the fax is for - then we can contact you when it arrives. 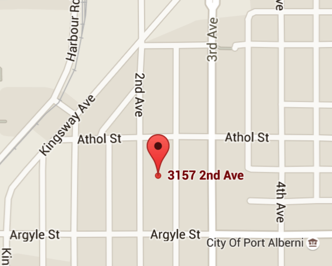 You can pick your fax up from our shop during regular business hours. To send a fax, just drop by The Graphics Factory when we're open, and we'll be happy to send your important documents locally, nationally or worldwide. The Graphics Factory can scan your colour or black and white documents into a PDF format to be sent by e-mail. Prices are for one e-mail address; send to additional e-mail addresses at the same time for just $1.49 each. For each cc'd E-mail address, add $1.49. Taxes not included in prices. Our wide-format roll laminator allows us to laminate sizes up to 24 inches in width and nearly any length. Small pieces are also easily laminated. 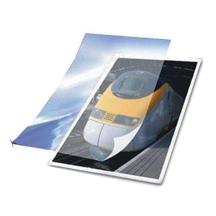 Laminating material is available in a variety of thicknesses, from 3 mil (very thin) to 10 mil (heavy duty thickness). The Graphics Factory doesn't laminate every day, so you will likely need to leave your item(s) to be included in the next batch. 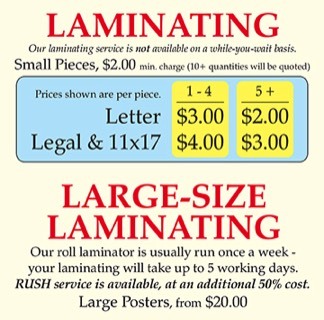 Whether you are protecting precious artwork done by the little people in your home, a restaurant menu, or small reference cards, our wide-format laminating service fits the bill. The Graphics Factory can produce handy fridge magnets to promote your business. From standard business card size to a variety of custom cut sizes, fridge magnets can be produced in .030", .020" and even in .014" thickness. 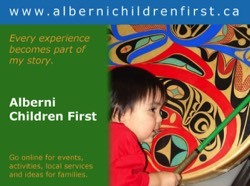 Use your existing business card design, or come up with something different to promote company. 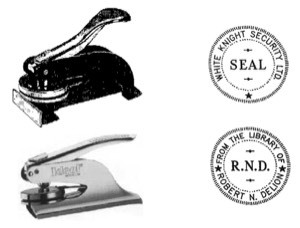 Rubber Stamps come in a variety of options. The Graphics Factory can help you find a stamp that meets your needs and budget. Basic wooden handled rubber stamps are best for budget and flexibility. Printy stamps are self-inking and very convenient. 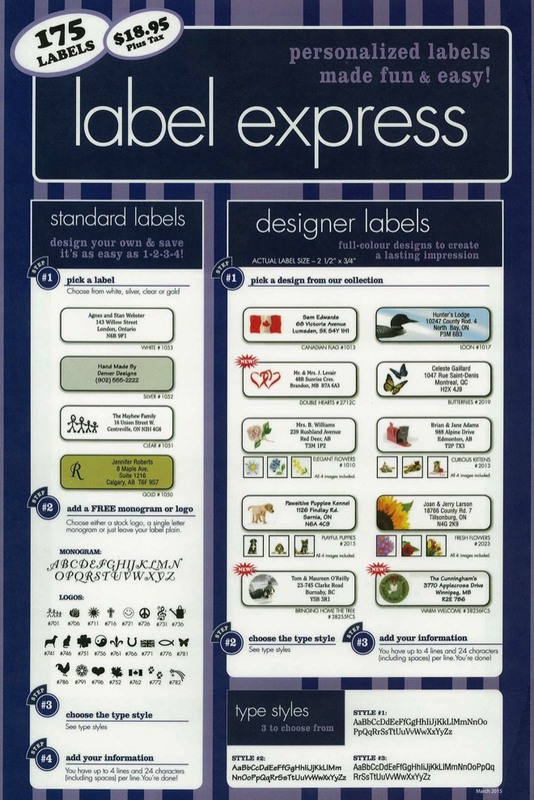 For a great impression and convenience, MaxLight pre-inked stamps fit the bill. Trodat Professional Line is suitable for heavy-duty use in the office and warehouse. 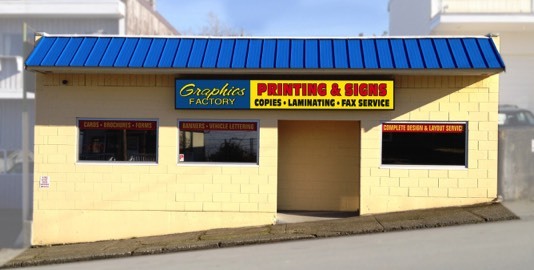 The Graphics Factory can also supply you with ink pads & ink refills, replacement dies for worn-out stamps, and unique pre-made stamps. Also available are multi-colour stamps, roller stamps, pocket stamps, pen stamps and dater stamps. Tell us about your stamp needs and we'll do our best to help you find the best fit for you. Looking for seals and embossers? The Graphics Factory can handle those too! The Graphics Factory offers personal address labels based on the templates below. Drop in to our shop to order your labels anytime during business hours.